Baltimore City claims that police review each citation before it is mailed. However this review apparently does not extend to ensuring that the car can actually be identified. One Maryland driver received recently received a citation for a car which did not belong to him, for which the photos taken were so dark the vehicle could barely be seen. The driver had been surprised to receive a Baltimore City speed camera citation in the mail dated 12/27/2010. The reason for his surprise was that "the last time I was in Baltimore at all was a few years ago" -- at which time Baltimore did not even have speed camera tickets yet. After looking up the address on the citation, he realized it was in a location he had never been in his life. He was further surprised by the fact that the citation included no photos, since it is a requirement under state law that speed camera tickets show two time stamped images of the cited vehicle. 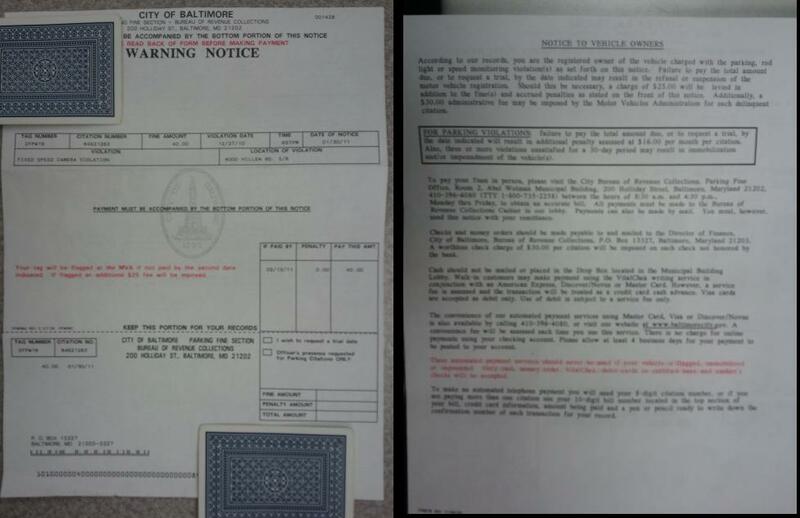 Presumably the 'citation' was apparently actually a 'second notice' but he had never received a prior citation ( StopBigBrotherMD.org has heard from other drivers where the first notice they received from Baltimore did not have images). After contacting the phone # on the ticket (which is run by the camera contractor, ACS), he was able to download the violation images from the website. And then the next surprise: you cannot even see the car itself in the image. 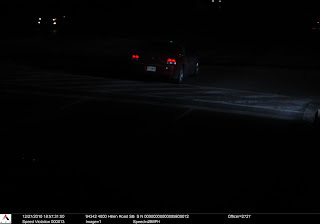 The nighttime photo was so dark only the tail lights, hub caps, and license plate were visible. The license plate number appear to match his own, except that one letter (a W on his plate) is blurred beyond recognition and is actually an 'N' or an 'M'. While the cited car itself can barely be seen, by brightening the image and zooming in it is possible to still compare the visible portions. Notice that the cited vehicle has round tail light, whereas the photo of the recipient’s car (top)has triangular tail lights. The cited vehicle appears to be a 4 door sedan whereas the recipient's car is a 2 door coupe. 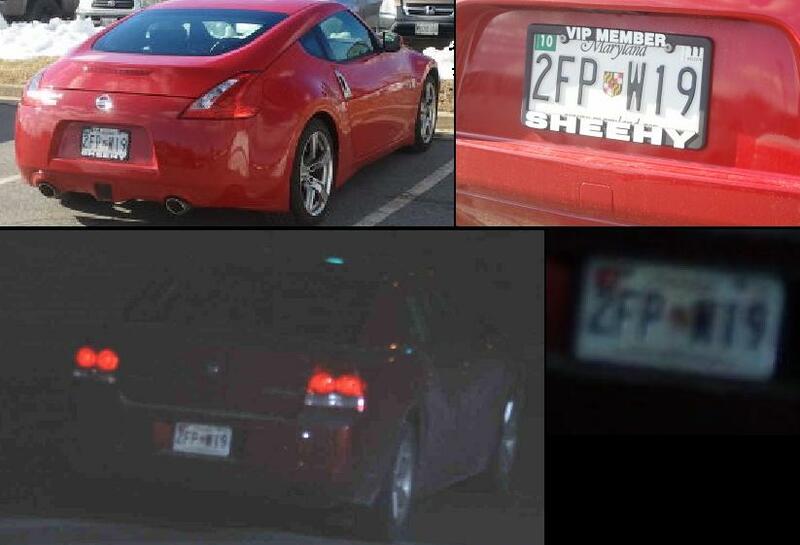 You can also see the registration sticker on the upper left corner of the cited vehicle's plate is red; the ticket recipient's sticker is green. Yet this could not possibly be correct, since in a full second the vehicle would have traveled several car-lengths at the cited speed of 49mph. We recently did a story on how drivers in Forest Heights were able to use image timestamps to demonstrate that speed measurements in error. Well with only 1s of precision, when the real interval is likely in the range of 0.2-0.3s but could in theory be anywhere from 0.01-0.99s, proving oneself innocent by a time-distance calculation would be impossible! It appears some camera contractors "learn from their mistakes" and are now rounding off the image timestamps to the point where such verification is impossible. Having collected this information to challenge the ticket, he then proceeded to contact the city, who told him they would 'put in a dispute' and that he needn't even worry about requesting a hearing. No problem? But then, just to be on the safe side, two days later he called them back to check. The person answering his call said they had nothing in their system about any dispute and didn't even have a record he had called previously. It appears the mantra for dealing with Baltimore City is "Trust but Verify". Baltimore's review of photo citations has come up as an issue before. Two days ago it was reported that the signature of a deceased Baltimore City Police Officer appeared on approximately 2000 red light camera citations after he passed away. 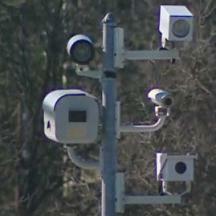 In early 2010, Baltimore City issued 932 tickets in error after a camera was configured to the wrong speed limit. StopBigBrotherMD.org has received other reports of similar citations issued to the incorrect vehicle. One business owner reported to us that she had received multiple speed and red light camera citations for a vehicle which had a plate number differing from one of her vehicles by one digit. Another driver wrote to us that they were assured by the city that their ticket would be taken care of without a hearing. She contacted the city department of collections and eventually received a response from Jacqueline McCullough, (Parking Fines Section, Bureau of Revenue Collections) dated Monday 10/18/2010 stating "A review of the systems indicated citation 82761347 was issued in error." Apparently it is up to members of the public to review camera citations for Baltimore City.